I bought this delightfully original Ladies Triumph in 2008, from well-known collector Rod Safe. He had been displaying it at a museum in Portsmouth, but visitors kept stealing accessories from it so he withdrew it. This Triumph Ladies Special Tourist was an upmarket bike in its day, with extra features such as Resilion brakes and quick-release nuts. When I obtained it, I’d been searching for a pre-Raleigh Triumph. 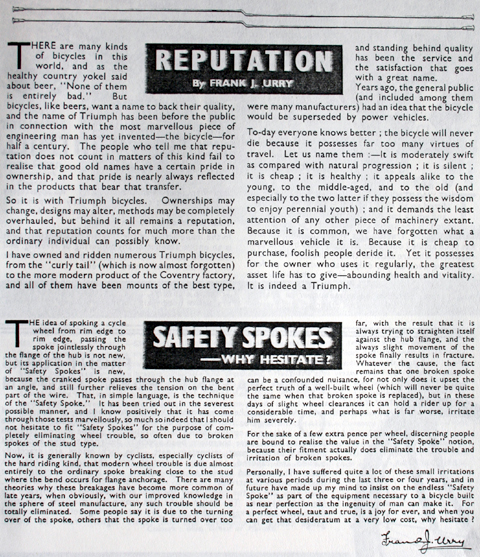 (BSA took over Triumph Cycles in 1936, to be later absorbed by Raleigh). But they’re no longer easy to find. 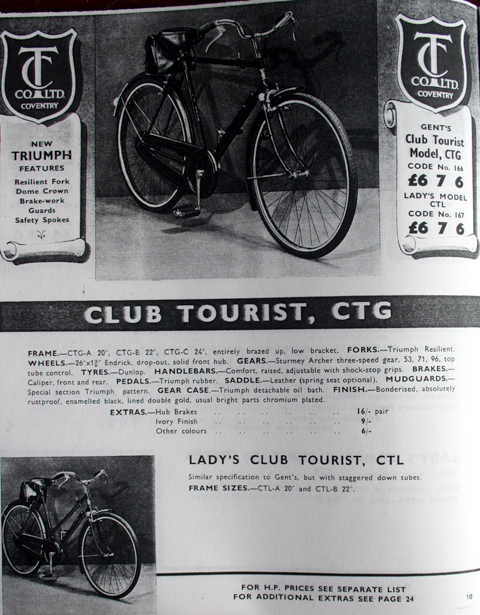 The Ladies Model (RTL) cost £6 7/- 6d in 1937 and £6 19/- 6d in 1939. I’m not sure of the 1934 price, as I’ve only seen the 1937 and 1939 catalogues. There’s a difference between the catalogue illustrations here, which have staggered down tubes, whereas this earlier Triumph has parallel tubes. I’m not sure what year the frames changed. To me, full oil-bath chain cases sum up that past golden era of cycling when the roads were still empty (though, actually, the roads were still very dangerous for cyclists). As you can see from the photos, the paintwork is original and unrestored, retaining its original transfers (decals). The bicycle no longer has the Triumph inflator pump seen in the photos, but is fitted with another one that does not have the word Triumph on it. 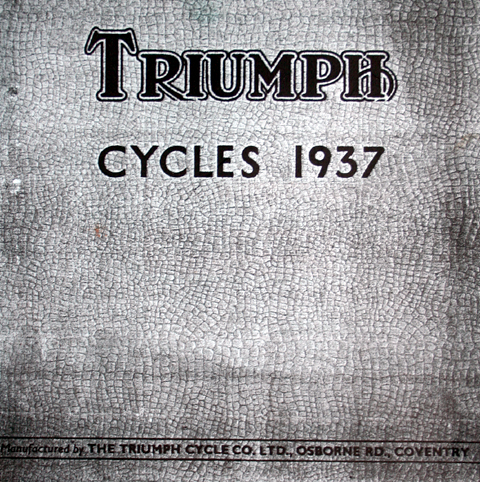 The Triumph has been in storage for five years. On sale, she will be serviced, and new tyres and tubes fitted so she’s ready to ride. Love in the Shadow of War? These two Triumphs have been parked together in my storage for many years. Unfortunately, although I check in every now and then, I’ve not yet heard the patter of any Triumph Juveniles.